Mr. Ed Rivers Delk, 81 of Lake City, passed away on Saturday, October 20, 2018, at the Haven Suwannee Valley Hospice Care Center in Lake City. He was born in Homerville, Georgia a middle child of ten to the late Tharpe and Mary Jane Herrin Delk. Mr. Delk was raised in Homerville and moved to Lake City in 1960. 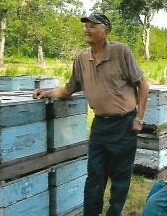 He was an equipment operator for many years with Columbia County and he was also a longtime beekeeper. Mr. Delk enjoyed hunting, fishing and visiting with his family and friends. He was preceded in death by 8 siblings, Melva Delk Griffis, Edna Vermell Delk Fitchett, Ollie Mae Delk Swearingen, Rosa Lee Delk Smith, Tharpe E. Delk, AV Delk, George Raymond Delk and Roy L. Delk. Survivors include his wife of 58 years, Hazel S. Delk, Lake City; two children, Athena Peel (Dempsey), Lake Wales, FL and George Allen Delk (Brenda), Lake City; one brother, Henry Bruce Delk (Carolyn), Homerville, GA; four grandchildren, Lance Rivers Peel (Maggie), Lake Wales, Ledia Peel (Jason Geier), Lake Wales, Jarrett Allen Delk, Lake City and Savannah Nicole Delk, Lake City; three great grandchildren, Emillie Geier, Kaylee Geier and Kevin Rivers Geier; and numerous nieces and nephews also survive. Funeral services will be conducted on Tuesday, October 23, 2018 at 11:00 A.M. in the Gateway-Forest Lawn Memorial Chapel with Rev. Howard Thomas officiating. Interment will follow at Oak Grove Cemetery, US 441 North of Lake City. Visitation with the family will be from 5-7:00 PM Monday evening, October 22, 2018 at the funeral home. In lieu of flowers the family asks that memorial contributions be considered to Haven Suwannee Valley Hospice Care Center at 6037 W US Hwy 90, Lake City, FL 32055.